Cut the Rope: Magic is here, appearing — unexpectedly, like the best part of a great magic trick — a day earlier than its announced release date. 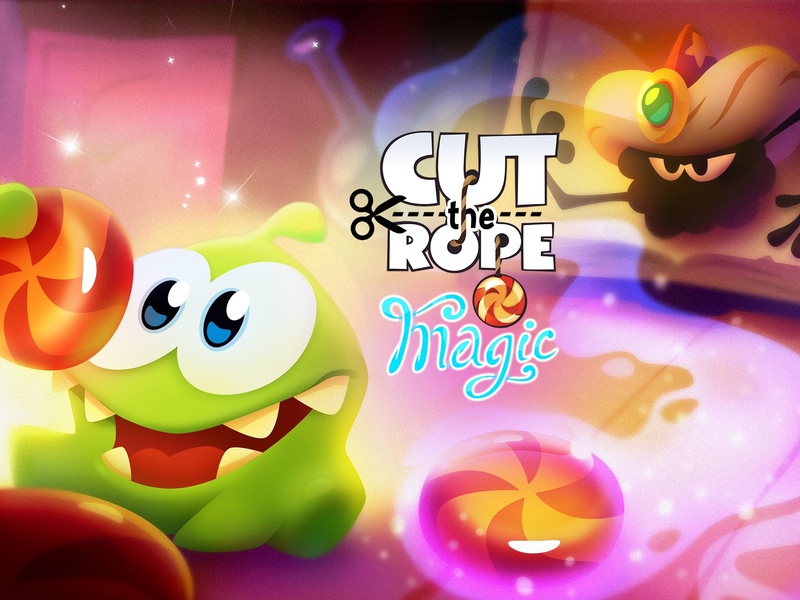 Cut the Rope: Magic is, of course, the latest installment in ZeptoLab’s family-friendly franchise starring the cute and cuddly candy-craving creature Om Nom. In Cut the Rope: Magic, as in its predecessors, you solve physics-based puzzles primarily by cutting ropes so as to help Om Nom get his all-important candy fix. But Cut the Rope: Magic features a new gameplay element in the form of Om Nom’s newly acquired shapeshifting ability. You see, as the game’s story goes, an evil spider wizard has stolen all of Om Nom’s precious candies and spirited them away into a magical spell-book. 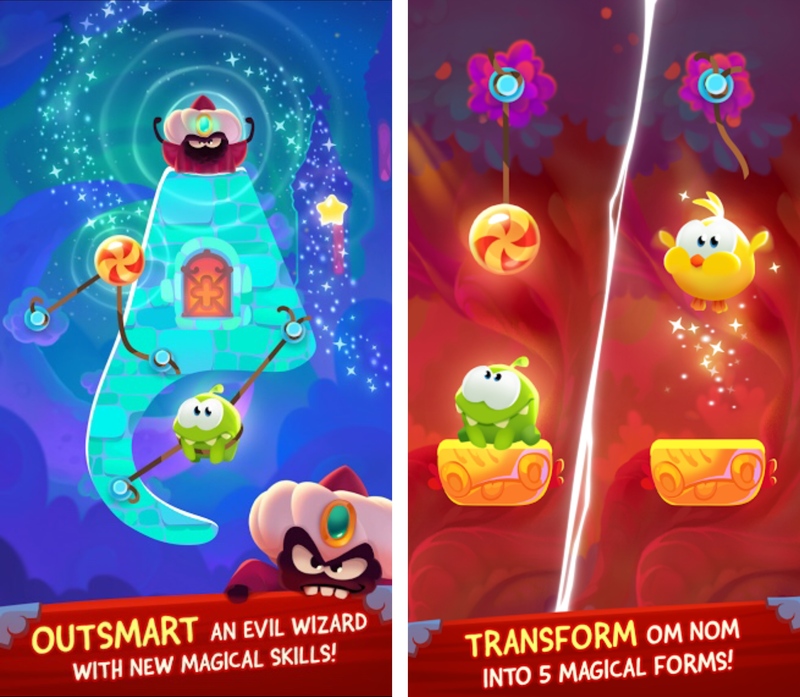 Now, you have to help Om Nom take back what’s rightfully his by guiding him through the tricks and traps laid out by the wizard across more than 100 magic-themed levels. And the neat thing is that you can get Om Nom to transform into five different magical forms (bird, baby, mouse, fish, spirit) to help him get to the candy in every puzzle. For example, Om Nom can turn into a bird to fly up, up, and away, or into a fish to swim underwater. Compatible with iPhone, iPod touch, and iPad, Cut the Rope: Magic is available now on the App Store for $0.99, with in-app purchases for buying additional in-game items, unlocking new puzzles, and revealing solutions. Cut the Rope: Magic joins the original Cut the Rope game, the spinoff editions Cut the Rope: Experiments and Cut the Rope: Time Travel, the sequel Cut the Rope 2 (which was Apple’s Free App of the Week last week), the now defunct special holiday edition Cut the Rope: Holiday Gift, the augmented-reality game Om Nom: Candy Flick, and the virtual pet app My Om Nom in the ever-expanding Cut the Rope franchise, which is also set to include a feature-length animated film. If you’re a fan of the Cut the Rope franchise (just like us here on AppAdvice), then Cut the Rope: Magic is an absolute must-have. 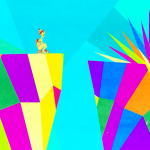 If you’re new to Cut the Rope, prepare to find out what all the hype has been all about and discover how the franchise’s brand of casual yet clever puzzle gaming is able to repel stress and boredom … like magic.